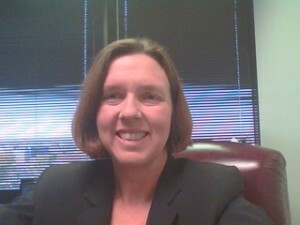 As a medical recruiter, you must find highly qualified people in a tight labor market. The first article in our series addressed the basics of finding physicians and nurses with specific keywords. Now you can refine your searches to identify people with specific training, certifications, and language skills by using the operator AND. Once again, we at HospitalRecruiting.com not only describe the necessary steps to conduct Boolean searches in Google, we give you strings that you can use right away! As we discussed in the first article, make sure to use the minus sign to eliminate jobs and resume services that come up when you want the resumes of MDs and other healthcare professionals. Your search then brings up a list of resumes of trained cardiologists. Now you might want to restrict your search geographically. If you have an opening for a cardiologist in Illinois, you might want to include a phrase that searches for the state (Illinois or IL). Another way to restrict the resumes you receive is to put the area codes in parentheses. 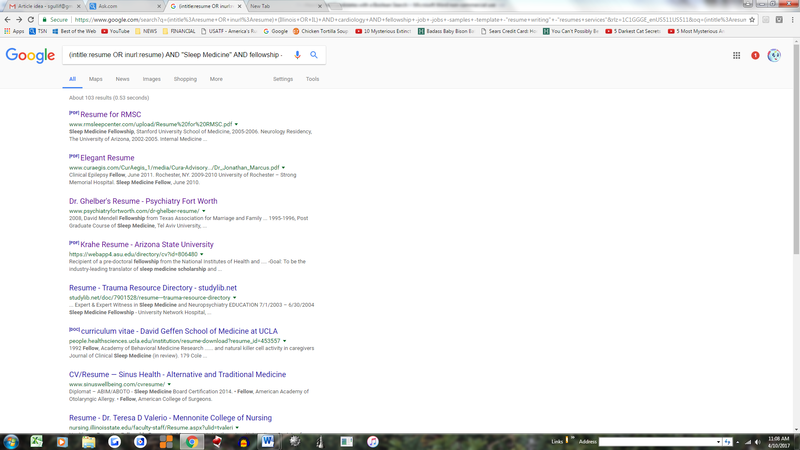 When you put those words in parentheses, your Google search yields multiple pages of resumes for trained specialists in Sleep Medicine. There are a number of combined fellowship programs, such as for hematology/oncology. Plug in this string to yield great results. You need to experiment with this string to identify other phrases that candidates might use to indicate that they are Board Certified in Internal Medicine. For instance, other candidates might state they are “Board Certified: Internal Medicine.” You might also substitute “American Board of Internal Medicine” for the phrase “Diplomate in Internal Medicine” to improve your results. Bilingual physicians and nurses are highly sought after in some areas of the country. 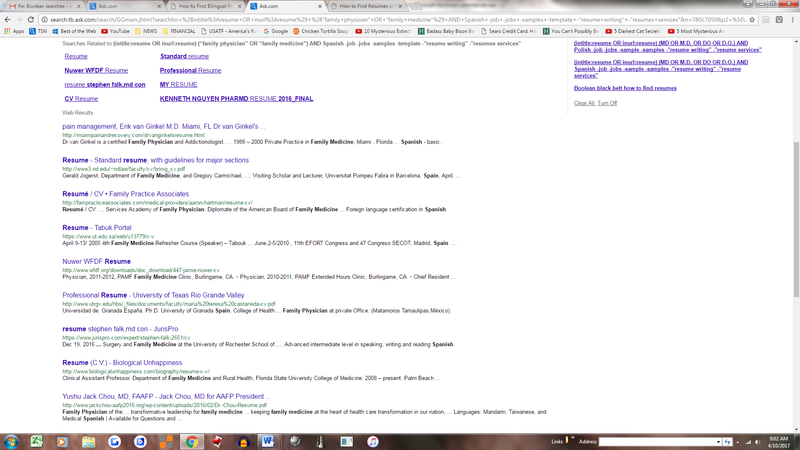 If you are recruiting for a family practice and Spanish skills are a must, try this Google search. 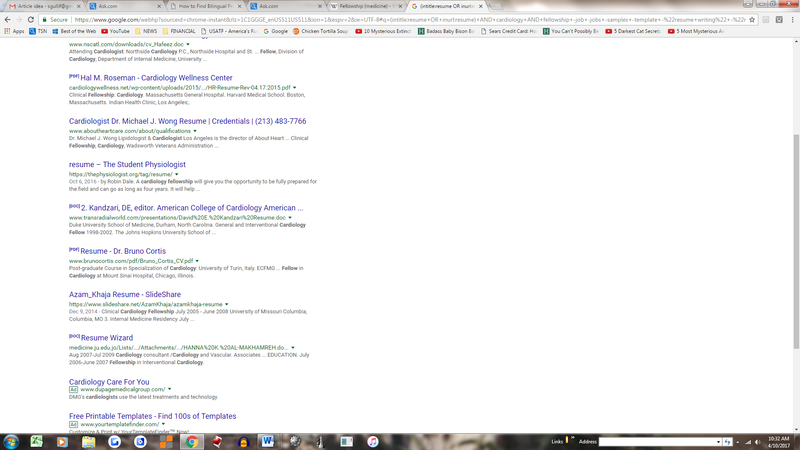 As you can see, the first page of Google brings up a variety of resumes. Based on the demographics of your area, you can include any number of languages such as Polish (if you are in the Chicago area) or Korean (for instance, in the Greater Los Angeles are). Just remember to capitalize the AND operator to make the string function properly. We hope our series of articles about Boolean searches for healthcare recruiting was helpful to your recruiting efforts. Please feel free to share your favorite Boolean search strings in our comment section below.